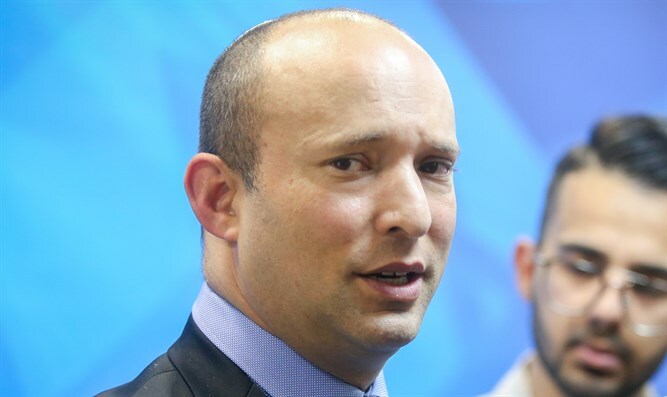 New Right Chairman outgoing Education Minister Naftali Bennett on Monday afternoon noted that his party lacked just 1,452 votes to pass the electoral threshold. In a Facebook post, Bennett wrote, "Over the past day, we've made surprising progress. The chance is not great, but it's not not small either. We're not going to give up. The gap between us and the electoral threshold is 0.0003 of all votes, and the deadline is Wednesday night. Today, Monday, is a crucial day." "Out of 11,000 polling stations around Israel, we found 400 summaries from station secretaries or members of the Central Elections Committee, and we compared them to the protocols and the computer. We found 219 (!) missing our ballots. That's a huge number when relative to the 400 polling stations whose summaries we have. We submitted that discrepancy to the Central Elections Committee and we're waiting for the results. I want to emphasize that these are what seem to be discrepancies, until we receive the Committee's results. "If in even a third of those there are significant discrepancies, that would show that on a national level, we could easily pass the missing 1452 votes. "I don't know if we'll succeed or not. I know that there's a chance, and Ayelet [Shaked] and myself see that there are a lot of Israelis who are praying for it." He also thanked the "thousands" had volunteered to help and "hundreds" had actually helped. "Some people laugh at our efforts to pass the electoral threshold," he added. "We will work and try, we'll do everything we can. That's how you succeed in studies, in hi-tech, in the army, everywhere in life. You work hard. As Education Minister, this is the message that I want to send every student, and in general to every entrepreneur, every person who wants to achieve a goal: Work. Don't give up. As long as there's a chance, continue fighting."